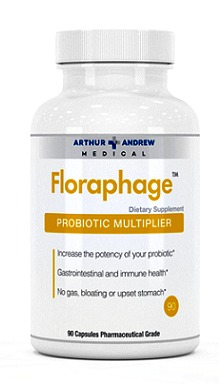 Floraphage was designed to increase probiotic bacteria counts when taken with or without probiotic supplements. It produces natural sources of nutrients for these bacteria by specifically targeting harmful strains of e coli. It penetrates the cell wall and kills it from the inside out and in the process, e coli releases its nutrients into the intestine, detaches from the intestinal wall to be disposed of in the stool. Good probiotic bacteria feed like crazy on these nutrients and move into the freed up space on the intestinal wall, forcing out bad bacteria and yeast. This process is extremely useful when battling yeast infections and bad bacteria or sibo. The phages in the name Floraphage are a type of protein that specifically targets certain species of bacteria, in this case, pathogenic e coli. If you have ever had a urinary tract infection, you have pathogenic strains of e coli. The phages do not target other bacteria and are completely harmless in the human body. Pathogenic e coli grows very quickly, much faster than bifidobacteriums, acidophilus and other good strains. They attach to the intestinal wall and will not allow the good bacteria to attach. They will form large biofilms which allows them to avoid detection by the immune system and spread at will. These biofilms can result in chronic itching of the skin. They are observed in increased numbers in inflammatory bowel disease, Crohn's disease and ulcerative colitis.1 It can cause chronic diarrhea and other intestinal distress. I suspect that they are a major cause of small intestine bacteria over-growth or sibo for short. Bacteriophages are simply a bacterial predator that are found everywhere in nature and we consume them everyday in our foods.They coexist within the host typically living in the mucous layer that protects the intestinal surface. They feed on pathogenic strains of bad bacteria helping to prevent infection within the host. They have been found by the Department of Biology at San Diego State University, to be natural inhabitants of our digestive systems.6 This study that was published in the US National Academy of Science in 2013, along with this picture show how that relationship works. It's a symbiotic relationship that protects our intestinal epithelial cells from bacterial infection. Prior to the invention of antibiotics, phages were used in people and added to poultry feed to prevent infection. In recent years, some chicken farms have stopped using antibiotics due to the rise of antibiotic resistant bacteria, and have been adding phages to their feed again. Today, with so many medical advances since 1940, these phages can be analyzed to see exactly what bacteria they kill. In the old days they did not have this ability so they would prescribe bacteriophage cocktails and hope for the best. In the future, you are going to see a lot more of this medical technology come to the forefront. A simple test could reveal what type of bacteria you are infected with, and the appropriate bacteriophage prescribed that targets that bacteria, no more mass killing of bacteria like antibiotics. Gone will be the days of losing 30% of your good bacteria to a two week course of broad spectrum antibiotics, which can take a year to recover from. This two week course can also allow bad bacteria to get out of control before your good guys grow back, e coli included. The experiment was set up to simulate the physiological conditions of the small intestines. Four probiotics were selected along with individual strains of probiotic bacteria. E coli levels were also tested with and without Floraphage and FOS(inulin) was also compared for its growth effects. Four probiotics were tested, Jarro-Dophilus EPS, Syntol AMD, Dr. Ohhira’s Probiotics, and PB8. The Jarro formula contained Lactobacillus and Bifidobacterium and showed a 1636% increase in numbers over control. Syntol AMD contained Lactobacillus, Bifidobacterium, B Subtilis, and Saccharomyces and achieved a overall 5017% increase. Dr. Ohhira’s formula contained Lactobacillus and Bifidobacterium and showed a 2667% increase in numbers over control. PB8 contained Lactobacillus and Bifidobacterium and showed a 331% increase in numbers over control. Overall, Floraphage increased these bacteria numbers by an average of 2400% or 24 times. The bacteria below showed significant growth when combined with Floraphage compared to growth without. 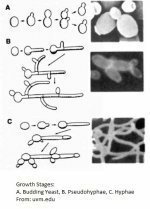 B. Breve, b. animalis, b. longum, l. casei, and b. subtilis are all found in Profase and are all good yeast killers or immune system stimulators. Taking one 30 billion capsule of Profase with one capsule of Floraphage, could turn 30 billion bacteria into a possible 720 billion bacteria. Yeast killing on steroids! Especially when combined with the biofilm busting abilities of Biofase! Test were performed to monitor the effects on e coli over a 10 hour period as well. After 60 minutes of taking Floraphage, e coli levels began to crash, after 10 hours, 50% had died. Untreated samples of e coli continued to grow adding 30% to their numbers in 10 hours. B Longum, B breve and E coli were tested using Floraphage verses Inulin, a very popular FOS based prebiotic. Floraphage achieved 500% more growth of b longum verses Inulin and 132% more with B breve. L. lactis was studied in-vitro with and without e coli present. Both seperately grew at comparable rates but when combined, e coli significantly inhibited the growth of L. lactis and overall out grew it. This experiment proved that e coli inhibits the growth of good bacteria. When FLoraphage was added to the mix, it reversed the growth pattern, e coli was severely reduced and L lactis levels went through the roof. You can read the entire study here if you choose. Most of the time, it is reduced good bacteria numbers that allow yeast to get out of control. Most of these bacteria crowd out yeast by attaching to the intestinal wall which does not allow yeast any place to take up residence. Other species, like those found in Profase, actually kill yeast while also stimulating the immune system. E coli however, outgrows these good bacteria by attaching to the intestinal wall and does not allow them to take up residence. The e coli forms biofilms and these biofilms can lead to the chronic itching that most often happens to suspected yeast sufferers. When Floraphage is combined with a good biofilm digesting yeast eating enzyme such as Biofase, and a yeast killing immune system stimulating probiotic such as Profase; you can not only get the yeast infection under control, but will also remove any pathogenic e coli. Good bacteria levels go through the roof which can lead to a long term recovery. I highly recommend that Floraphage be incorporated into any yeast or bad bacteria cleansing program. It's safe to take long term and has been proven to do what they claim, kill e coli and boost good bacteria numbers. I would take it with Biofase and Profase. All you need is one capsule taken at the same time to achieve good results. Floraphage is available at this website. Any questions, you can contact us from the contact page of this website. 1. Rolhion N, Darfeuille-Michaud A (2007). "Adherent-invasive Escherichia coli in inflammatory bowel disease". Inflamm. Bowel Dis. 13 (10): 1277–1283. doi:10.1002/ibd.20176. PMID 17476674. 2. Bruttin A., Brussow H. Human volunteers receiving Echerichia coli phage T4 orally: a safety test of phage therapy. Antimicrob Agents Chemother. 2005;49(7):2874-2878. 3. Alissky J., Iczkowski K., Rapoport A., Troitsky N. Bacteriophages show promise as antimicrobial agents. J Infect. 1998;36(1):5-15. 4. Dabrowska K., Switala-Jelen K., Opolski A. , Gorski A. Possible association between phage, Hoc protein, and the immune system. Arch Virol. 2006;151(2):209-215. 5. Gorski A., Weber-Dabrowska B. The potential role of endogenous bacteriophages in controlling invading pathogens. Cell Mol Life Sci. 2005;62(5):511-519.